He quotes Albert Schweitzer, reads books about everything from management to self-help and was drafted by the Detroit Pistons in the sixth round of the 1971 NBA draft. But Jim Larranaga, head coach of the men’s basketball team at the University of Miami, is best known for something completely different. “Well, first thing I thought about was the Final Four run,” said shooting guard Rion Brown of his first thought of Larranaga. 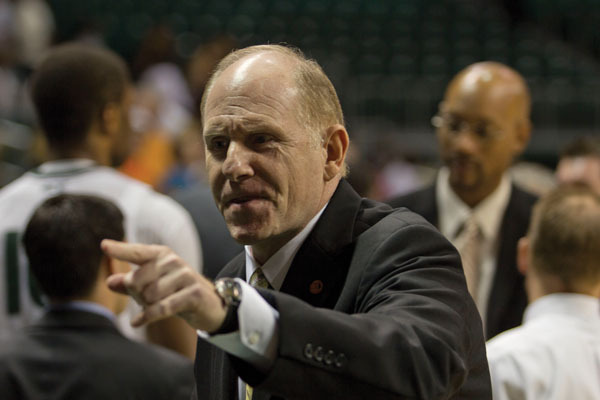 However, while his famous run with George Mason in 2006 certainly catapulted “Coach L” into the national spotlight, it was 20 years earlier that his success story started as head coach at Bowling Green. After 11 seasons with Bowling Green, which included three NIT appearances, opportunity came knocking again when Richmond, James Madison and George Mason were all looking for new head coaches. It soon became clear that Larranaga was just the man for the job. During his 14-year tenure with George Mason, he transformed the Patriots into the winningest program in Colonial Athletic Association history and become the most successful coach in the history of the conference. His unprecedented accomplishments culminated in the much-talked about Final Four run. “When we first arrived … we told everybody we were going to recruit locally and they said, ‘Well, you’ll never win, because Georgetown, Maryland and George Washington will get all the best players and you’ll stink.’ But on our Final Four team … the five starters were all from within an hour and a half from campus,” Larranaga said. It was also during his time with the Patriots that Larranaga introduced the country to his motivational skills and powerful pregame speeches, like when he told his team before facing UConn in the Regional Finals in 2006 that the CAA stood for Connecticut Assassins Association. The famous pregame talk was developed the morning of the game, when Larranaga read an article that made it very clear that the Connecticut players knew little about his team. Larranaga’s pregame speeches are often not quite so spontaneous, but rather meticulously conceived much earlier. His love for reading and broad arsenal of motivational quotes often aid Larranaga in instilling such a frame of mind in his players. But even though success has been following him wherever he goes, Larranaga has never lost sight of his main motivation. Larranaga did exactly that with Jai Lewis, a talented player who came to George Mason with one problem: He was 300 pounds. He saw Lewis’ potential and knew he had to be much more subtle in his approach. So Larranaga told Lewis, who planned on playing football after college, that he would send out letters to every NFL team and tell them about him, but that he had to be in good shape. Instead of demeaning him for what he wasn’t, he tried to enhance what he was. Lewis grew into George Mason’s leading scorer and rebounder when the team made its improbable run to the Final Four. At Miami, Larranaga is looking to do many of the same things that have brought him so much success in the past, and his goals are as ambitious as ever: to be mentioned in the same vein as Duke and UNC. If history has taught us anything, that goal is not out of Larranaga’s reach.